Sunflowers are a bright and wonderful theme for a birthday party! 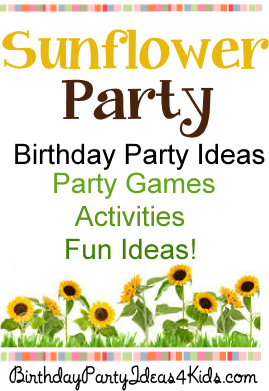 We've collected our favorite Sunflower theme party games and activities along with some fun ideas for party favors, goody bags and decorations. Fun for kids, tweens and teens of all ages! Teams try to fill their container with sunflower seeds the quickest. Divide players into teams. Each team should have a large bowl filled with sunflower seeds at their starting point and a small paper or plastic cup. At the other end of the playing field set up two containers that are equal in size such as empty gallon milk containers (the small opening of the milk jugs make the relay more challenging and easier to determine who wins at the end of the game). On “go” one at a time players take their teams plastic cup, fill it with seeds and then run and dump it into their teams container. Then they run back and hand off the cup to the next player. First team who fill their container wins! Give each player two bowls and a pair of chopsticks. Fill one of each players bowls with 25 sunflower seeds. On “go” players transfer their seeds from one bowl to the other using only their chopsticks. Fill a clear plastic container with shell on sunflower seeds. While you are filling the container count the seeds and write down the number. Seal the container. While guests are arriving to the party ask them to guess how many sunflower seeds are in the jar. Provide pencils and paper so they can write down their name and guess. At the end of the party read the guesses and see who is the closest to the number in the jar. Winner takes the jar home! You can substitute with candy corn, wrapped candies, etc. * If you can buy a full sunflower filled with seeds use it instead of placing the seeds in the jar. Guests will be amazed at how many sunflower seeds are contained in just 1 sunflower! Set the pumpkins out in a line going away from the starting line. Have players try to toss their seeds into the pumpkins starting with the closest and then in turn the next closest to them and so on. Pair the players into teams of two. Give one player on each team a handful of sunflower seeds, and give the other player a small paper cup. The player with the sunflower seeds stands 5 – 6 feet away from their partner and tries to throw as many of the seeds in their partners cup as they can. Set up a fun Fall Neighborhood Scavenger Hunt for party guests with a Fall theme! Our Fall Scavenger Hunt List has 30 fun Fall / Autumn theme items to find. Includes directions and set up instructions.